Algiers: The army has thrust itself into the kingmaker role in Algeria’s crisis, but as it works backstage to remove an ailing president and broker calls from the street for democracy, it will be careful to shore up its own immense political clout. For more than a month, Algerians have marched to unseat not only President Abdul Aziz Bouteflika but also the whole ruling elite—veterans of an independence war against France, plus their allies in the army, business, legislature and unions. But whatever new system ally eventually emerges from the upheaval, the army is signalling it wants to retain the decisive role in national affairs it has had since independence in 1962. With Bouteflika resisting immense popular pressure to step down immediately, the army chief stepped in to break the impasse on March 22 by calling on the constitutional council to declare the veteran head of state—82 and ailing—unfit to rule. In the days that followed, two leading political parties and the country’s biggest labour union—longtime establishment supporters of the president—echoed the army’s call. “The game is between the presidency and the demonstrators. And the referee is the army. So you can exclude a player, but you cannot exclude the referee,” said a retired army general. So far, the reaction to the army’s intervention from protest leaders—some of whom want a complete political revamp removing any army influence in politics—has been a mixture of caution and pragmatism. Some of those who are prepared to speculate see opposition politician Ahmad Benbitour as a possible contender. He resigned as prime minister under Bouteflika due to disagreements over the economic dominance of the ruling elite and lack of transparency. Other names include former communication minister Abdul Aziz Rahabi and former president and army general Liamine Zeroual. 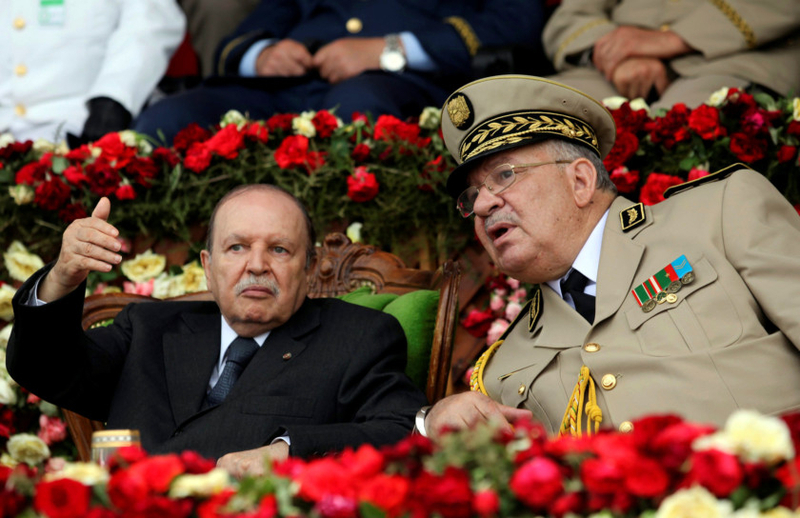 Algeria’s army chief summoned top military brass for an emergency meeting Saturday as he pushes for declaring Bouteflika unfit for office. Military chief of staff Ahmad Gaid Salah claimed Saturday that unnamed figures were plotting against the military, as tensions mount in Algeria’s political crisis. In a statement and remarks carried on Algerian television, Salah defended his proposal to launch a constitutional process to have Bouteflika declared too ill to serve. Salah reiterated his proposal to activate Article 102 of the Algerian Constitution, under which the Constitutional Council could determine Bouteflika is too sick to rule and ask Parliament to approve. The army chief also proposed to activate other constitutional articles in response to protesters’ demands. He dismissed allegations that his proposal amounted to an attempted coup d’etat, insisting he was not seeking power himself but looking for a legal way out of the crisis. Algerian media carried conflicting reports about who attended the secret meeting. Algerians took to the streets by the millions Friday for the sixth straight week of nationwide protests. The protests have turned the tables on the elite power structure, but it is unclear what lies ahead.